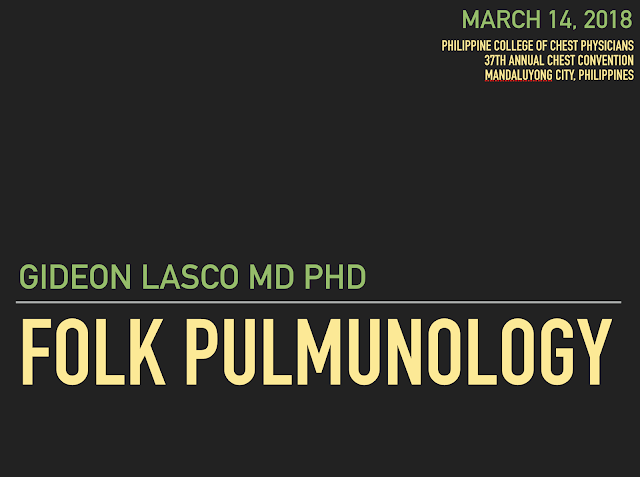 MANILA - As one of the keynote speakers at the 37th Annual Chest Convention of the Philippine College of Chest Physicians (PCCP), I talked about 'folk pulmonology', or patients' perspectives when it comes to their lung problems, in a 30-minute presentation on March 14, 2018. Drawing from the work of Prof. Michael Tan and Prof. Anita Hardon, I introduced the talks with concepts like 'hiyang' and the idea that cough is a particularly "socially-disruptive" disease because it is both 'visual and auditory'. I stressed the value of language, referencing dying terms like dalahik and dahak that could enhance the specificity of history taking and help build rapport between doctors and patients. I also mentioned explanatory models such as the 'hot-cold syndrome': the lungs is viewed as a 'hot organ' and can therefore be affected by the cold. I proceeded by presenting some insights, including the explanatory role of medicine: patients consult doctors not just to get well, but to find out what's happening in their bodies. I then concluded with a question: "What possibilities lie when we think of pulmonology not just as a profession that cures lung diseases, but one that allows patients to breathe better?" Many thanks to Dr. Eric Moral and all the members of PCCP for giving me a chance to share my insights! This topic is something that only clinicians and anthropologists can do working together and I hope doctors will pursue the many research possibilities - towards "culture-guided medicine" in the Philippines.